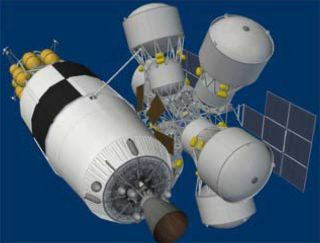 An artist's impression of a rocket destined for a journey beyond Low Earth Orbit being refueled at this spacedepot designed by Boeing. The idea of space gas stations has floated around – a Canadian company already has plans to launch a flying satellite gas station in 2015. But NASA's latest proposal represents a first step toward supporting future human and robotic missions to destinations such as the moon, asteroids, and Mars, rather than simply refueling satellites in Earth orbit. NASA wants to look specifically at liquid oxygen and liquid hydrogen, which have powered the main engines of the space shuttle and several commercial rockets. Its proposal calls for "zero boil-off storage" of liquid oxygen, and at least "minimal boil-off storage" of liquid hydrogen. To get a sense of that challenge, liquid hydrogen requires storage at minus 423 degrees F. The propellant must be shielded from outside heat sources such as the sun or rocket engine exhaust, lest it expand and perhaps cause a tank explosion. Still, the U.S. space agency said it would consider a mission costing up to $300 million, but only if the added cost comes with big benefits. Similarly, it may consider missions priced below the $200 million target if they can still do the job. NASA's commercial partners may also benefit from such refueling stations. Private rocket firm SpaceX currently holds NASA contracts to deliver astronauts and cargo to the International Space Station, but SpaceX chief Elon Musk has also set his sights upon the moon and Mars. This story was provided by InnovationNewsDaily, a sister site to SPACE.com. Visit SPACE.com for the latest in space science and exploration news on Twitter @Spacedotcom and on Facebook.